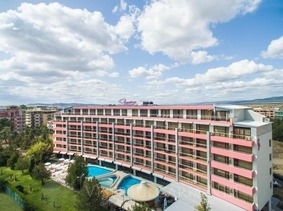 Hotel Flamingo in Sunny Beach resort on the Black sea in Bulgaria. Online bookings. Location: Hotel Flamingo is located in the western part of the famous and large Sunny Beach resort, 200 meters from the beach and 600 meters from the center of the resort. Accommodation: The hotel offers 158 modern and comfortable rooms. The hotel also offers family rooms - 2 interconnected double rooms with a connecting door. All rooms offer bathroom, air conditioning, satellite TV, telephone and balcony. Hotel Flamingo is ideally suited for families and couples looking for a good standard of accommodation. Wine and dine: The bar and the restaurant of the hotel is an excellent place to make new friends and enjoy a cold drink after a day of activity at the beach, sightseeing or shopping. Night entertainments nearby Flamingo hotel include traditional family restaurants with an excellent service and cuisine, numerous bars, clubs and disco's.